Each year, the Colorado River supplies water to more than thirty-six million people and irrigates up to six million acres of farmland as it carves its way through some of North America’s most arid landscapes. For millennia, the river has been honored as a life-giving being by the peoples who made their home along its banks: the Navajo, Hopi, Havasupai, Hualapai, and Zuni, among others. During its forty-five-million-year lifespan, the Colorado has etched itself into the fabric of the land in awe-inspiring ways, slicing through the Colorado Plateau to create the Grand Canyon and the twisting sandstone spires of Canyon Country. While much of the river’s majesty can be enjoyed today, some of its most exquisite creations exist only as memories. Up until the mid 20th Century, the Colorado supported one of the most productive river deltas anywhere in the world. Where the river met the Pacific Ocean, there existed a lush riparian and tidal delta the size of Rhode Island, supporting populations of migrating birds that blotted out the sun’s light when they took flight. 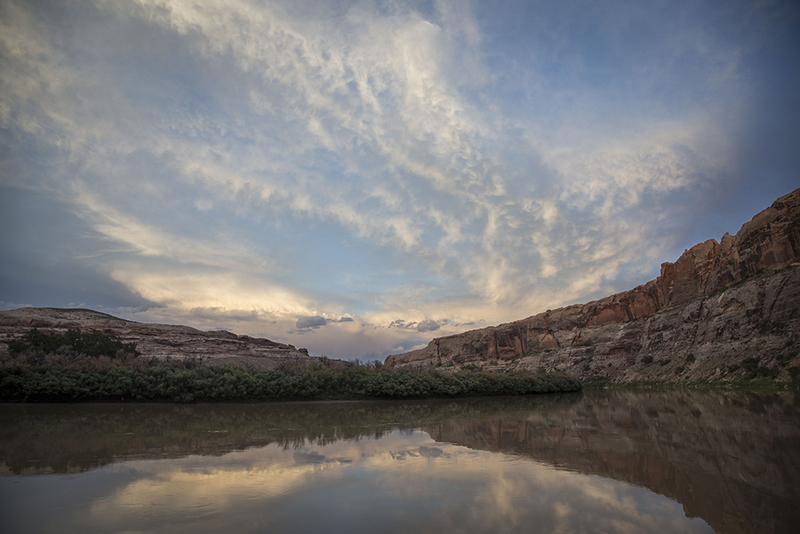 The river’s seminal work may have been the winding “realm of magic” coined by John Wesley Powell for its hidden side canyons and quiet alcoves as Glen Canyon. “The place no one knew,” as photographer Elliot Porter referred to the canyons, has lain entombed beneath the waters of Lake Powell, that burial ground for the wild, for over 50 years. Today, the Colorado is one of the most regulated and impounded rivers in the world, with 25 dams clogging its main stem and major tributaries and countless other diversions, canals, tunnels, and impoundments all scrabbling for a portion of its water. Since the gates were closed and Lake Powell began to fill behind Glen Canyon Dam, the river has reached its terminus at the Pacific Ocean only a handful of times. The once fecund delta exists today as a moribund and dusty expanse of tamarisk-choked desert. For the past two years running, the Lower Colorado River has been named the Most Endangered River in the US. The ignominious title comes as a result of decades of over-extraction and mismanagement coupled with the growing threat of Climate Change. "The country in defiance of all logic had become blindly committed to the agrarian settlement of the desert west. If the land itself refused to generate rain, the only option was to bring the rain to the land, and that meant irrigation on a scale previously unimagined." - Wade Davis in "River Notes"
With the 1922 signing of the Colorado River Compact, the river’s troubled future was sealed. The allocations stipulated by the compact, which divided the river’s flow between the seven basin states and Mexico, was based off a decade of abnormally high precipitation and river flows. Thus, for the past 100-years, The Colorado’s “paper water,” the theoretical water allocations it is counted on to supply, has far outweighed its “wet water,” the actual water the river carries. Farming operations reliant on the Colorado (accounting for the use of 78% of the river’s flow), burgeoning populations in desert metropolises such as Phoenix and Los Angeles, decades-long droughts, and the very real threat of Anthropogenic Climate Change have exacerbated the already-strapped watershed. Such threats have resulted in a glut of water deliver shortfalls over the past few decades and cultivated a slew of looming environmental crises. Included in the 1922 Colorado River Compact was a stipulation that the Upper Colorado River basin states, Wyoming, Colorado, Utah and New Mexico, were required to ensure an annual flow of no less than 7,500,000 acre feet be delivered to the lower basin states. Proposed first in 1950 and outlined by the 1956 Colorado River Storage Project, Glen Canyon Dam was developed as a storage bank that would ensure those allocations could be met, even in dry years. As part of a compromise with the Bureau of Reclamation and other federal agencies, Sierra Club director David Brower famously agreed not to oppose a dam in Glen Canyon in exchange for the preservation of Echo Park, another proposed dam site at the time. In later years, Brower would call the decision not to fight for Glen Canyon "the biggest sin [he] ever committed” and “the worst mistake of [his] career.” When the dam’s construction was completed in 1966 and the impounded river began to fill Glen Canyon, a place of incomparable beauty, known by very few, was slowly lost below the rising waters.